Welcome to the Pen Pit Stop. Here you will find reviews of pens that already have some mileage on them. More specifically, these reviews are of pens that are in my personal collection, and that have been in use for at least a year. I thought it would be fun to do it this way - no new & shiny pens here, but battered vehicles that have been put to work for at least a year. Let's find out how they have withstood the ravages of time. The fountain pen that arrives at the pit stop today is the "Kaweco AL Sport Raw Aluminum". Kaweco is a well-known German pen company, whose history dates back to 1883 with the foundation of the Heidelberger Federhalterfabrik (Heidelberg dip pen company). The brand is best known for its pocket pens of the Sport and Liliput range. As early as 1905 Kaweco had already manufactured the first writing instruments made out of metal. The AL Sport range is made of high-quality aluminum, and this particular "Raw" incarnation uses untreated aluminum which quickly develops a nice patina. I bought this pen in February 2015, and it has been in rotation as an EDC (Every Day Carry) pen since that time. This is one of my older pens, which has been in use for over 3 years now. Let’s take a closer look at it. This is a great EDC pen with an industrial look: no ornaments for this pen, except for the Kaweco logo on the cap's finial. 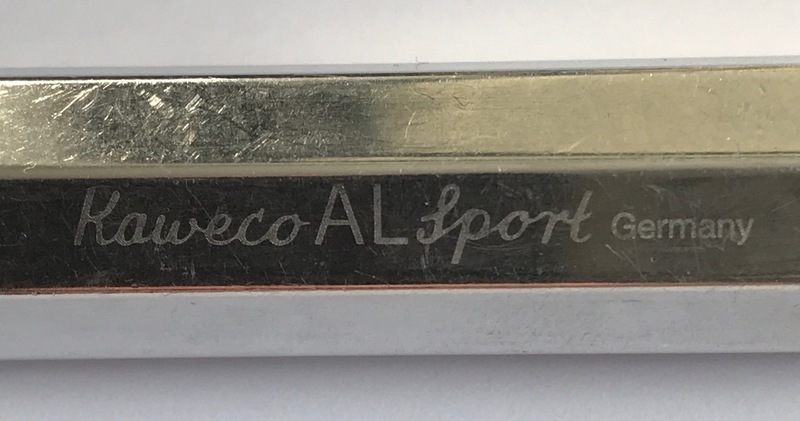 Etched on the side of the cap is the pen's designation "Kaweco AL Sport Germany". The pen is small enough to easily fit in your pocket (about 10cm capped). Because it's a workhorse pen, you don't have to worry about it getting scratched or dented by keys or coins. This pen is meant to take a beating, and gets its character from the scratches it accumulates during its lifetime. When you're ready to use the pen, just unscrew the cap and post it. You then get a full-sized fountain pen that is very comfortable in the hand. The cap has an octoganal design, which means that the pen easily stays on your desk without fear of it rolling away. Kaweco does sell separate pen clips if you absolutely want one, but I never used them - in my opinion they don't match with the industrial look of this pen. The nib on this pen is the same as that of the Liliput - and on this Sport model it looks a bit small. I would have preferred a slightly bigger nib, like the one on the Kaweco Supra. Being made of aluminum, the pen is very lightweight. It doesn't feel like a metal pen at all. The pictures above illustrate the size of the AL Sport as compared to a standard Lamy AL-star. With the cap on, the Kaweco is indeed a very small pen. In actual use though, the posted AL Sport is almost exactly the size of the uncapped Lamy pen – i.e. a real full-sized fountain pen. Build Quality: a very sturdy pen, that can really take a beating. I typically carry it around in my pocket together with my keys. As such, the pen accumulates lots of scratches, but it is designed for this, and this abuse gives the pen its character. As the pictures of my pen show, it has accumulated lots of scratches, clearly showing a pen that's been in use for some time. Weight & Dimensions: about 10cm when capped - and as such a small pen to carry around, perfect for an EDC pen. Being made from aluminum, this is also a real featherweight. Myself, I prefer a bit more heft in metal pens, but that's just a personal preference. Filling System: this is a cartridge convertor pen, that fits small-size international cartridges. Kaweco sells a mini-convertor, but I have never used it. I find it much more convenient to just syringe-fill small cartridges. Nib & Performance: I find the steel nib a tad too small for this pen, and would have preferred a slightly larger nib. A big plus though is that the nib units are user-changeable. Kaweco sells separate nib units in the sizes EF-F-M-B-BB. I really appreciate that you can easily replace the nib unit. You don't have to fear damaging your nib, since you can easily replace it. You can also experiment with different nib sizes. Nib units cost about 10 EUR - not too expensive. Price: about 65 EUR, including taxes. Great value for money. The Kaweco AL Sport Raw Aluminum is a great pocket pen, with a really nice industrial look. This is a very sturdy pen, that's meant to take a beating. My pen has scratches all over it, but they just give it character: this pen ages gracefully. The big question remains: would I buy this pen again, if I could go back in time? To this, my answer is a resounding: YES. The Kaweco AL Sport Raw Aluminum is a keeper. Edited by namrehsnoom, 02 November 2018 - 21:11. You dived into FP reviews with style, humor, a lot of useful info and great photos! Indeed Kaweco Sports are great EDC pens. OK, I am biased, my very first FP several decades ago was a Kaweco V16. Thank you for a nice visit with one of my favorite pens. This was the first metal Sport I purchased & still my favored one; the second one in brass was not pleasing & I gave it away. I always thought I would like a copper one but after the experience of the brass, I chose a copper Liliput & found it is also a winner, for me. I have several Sports in odd colors, a few Art Sports, but this Al in raw finish is just pretty near perfect & I especially enjoy it's looks after some traveling about. I love the fact that you are reviewing pens that you have used for a while. That gives us a much better appreciation of the pen, after the freshness factor has worn off. Nice review, thanks for sharing it. I've been eyeing the Al Sport recently, but the price feels steep to me (especially with Chinese clones available for literally a tenth of the price). I do have a plastic demonstrator version of the Sport, and a couple of inkball demonstrator Sports as well, that I meant to convert to eyedroppers, but I never actually got around to it. This review has me considering it again. Excellent review. I must say I like the scratches on EDC pens. Very good. The task would now be redundant, but yesterday I was thinking about posting a review of the Kaweco AL Sport I bought in 2005. It was a slightly different design back then (more cap threading), but basically the same pen. After rattling around my pocket or bag for much of the intervening 13 years (it has fallen out of favour now and then) it looks much more beaten up than yours and still writes perfectly. Great review! Appreciate an approachable pen reviewed after use. Thanks for the review! Very thorough and great pics of your worn-in pen. Awesome. I don't have one of these pens in my collection yet, but your review is pushing me to remedy that rather quickly haha. Thank you for the great review. Classic pen, and the aluminum body gives it that elegant, no-nonsense, classic feel!